The HD remaster of Final Fantasy X and its sequel, Final Fantasy X-2, has been released in Japan along with its Ultimania book. 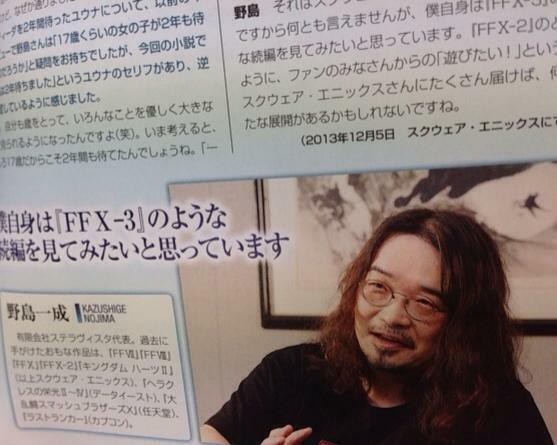 In an interview in the book, writer Kazushige Nojima, who has worked on countless titles in the series as well as the upcoming Final Fantasy XV, discusses the possibility of a third Final Fantasy X installment. Final Fantasy X | X-2 HD Remaster contains an audio drama which depicts the events of Spira one year after the events of Final Fantasy X-2. Not only that, but a novel will be released in Japan titled Final Fantasy X-2.5. What are your thoughts? Would you like to see Square Enix return to the world of Spira for a third time? Final Fantasy X | X-2 HD Remaster releases in North America on March 18th and in Europe on March 21st, 2014 for PlayStation 3 and PlayStation Vita. So far the vast majority of people, from what I've seen have voiced their disapproval. Lots of people don't think it should happen at all, and have the series end as is. I wouldn't mind it, i love Spira. as long as it will add to it. Wouldn't weight the ideas of one individual guy that much. I mean there was already talk about a FFX-3 when they where still developing FFX-2, but back then the project never came as well. well there is a difference between a remake and a sequel. I've heard that several events occur in the audio drama which pretty much sets the stage for a sequel, not that I would want one though. Final Fantasy X-2 was enough, thank you.